Signs around Jerusalem mistakenly say 8 PM, but the funeral will be at 10 PM. During 12 - 3 PM every day the family will be on a break, so please do not come during those hours. Visitors should not come later than 9:30 PM, to allow the family for private time as well. 8:15 AM -- Friday Morning, Erev Shabbat Chayei Sarah. RivkA's resting and her pain management seems to be under control. For the past day, RivkA is less interactive that she was earlier this week and she is resting almost all the time. Though very weak, RivkA is aware of her surroundings and hears much of what's going on around her. 1. Visitors are encouraged for short stays! However, only 1 or 2 friends are being allowed in at a time, so you may need to wait. The family very much appreciates all her friends coming to visit, because it also helps the family if they need to step away for a minute, as they don't want to leave RivkA unattended. RivkA knows there are people around her, and she takes comfort in that. 3. The exact quote from RivkA on Sunday evening was: "I am now in a different state" (RivkA's sister asked that it be corrected.) There is another sentence or 2 she said which we'll try to post at some point. Wishing RivkA, her family and friends, a restful and peaceful Shabbat weekend. 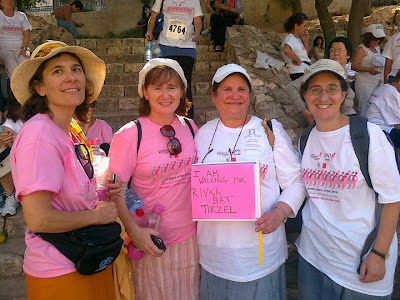 Update: Here's a photo of RivkA's friends at the "Race for the Cure" this past Thursday in Jerusalem. RivkA's pain-management doctor reported to Moshe that he believes RivkA's pain is less than before due to the procedure this morning. RivkA is mostly quiet now or sleeping. Moshe told RivkA that her blog is now being updated as she requested, so that her many friends can be kept in the loop. I'm reminded of RivkA's post from 2007, "No Droopy Eyes Please"
Okay, so here is the deal: I don't want people to look at me with sad, "droopy" eyes. I don't want people to think of me and feel sad. I don't want people to see me and feel sorry. I don't want to be the cause of worry and concern. I know that when you first hear the news, it's a bit of a shock. So it's okay to be sad in the beginning (I was too). But don't stay there! I don't mind talking about the cancer or what's going on. Chemo certainly affects the day-to-day of my life, so there's no ignoring it. But I really don't intend to hang out in some dark, depressing emotional pit. When you think of me, be happy. When you see me, smile. RivkA isn't as talkative as earlier, but she (and her family) are very appreciate of the friends who come and speak to her for short visits, even if she has her eyes closed. Batya's "RivkA on my mind"
This week's JBlogosphere roundup "Haveil Havalim" was dedicated in honor of RivkA. In fact, if you google for "RivkA bat Teirtzel" there are over 22,000 results of caring people who are publicizing her name, so that prayers, tehillim, and happy and healing thoughts are directed on her behalf. If you write a blog post about RivkA, please leave a link to it in the comments section. Praying that RivkA will have an easier day. Update: Kudos to all of those running in the "Susan G. Komen Race for the Cure" today in Jerusalem. 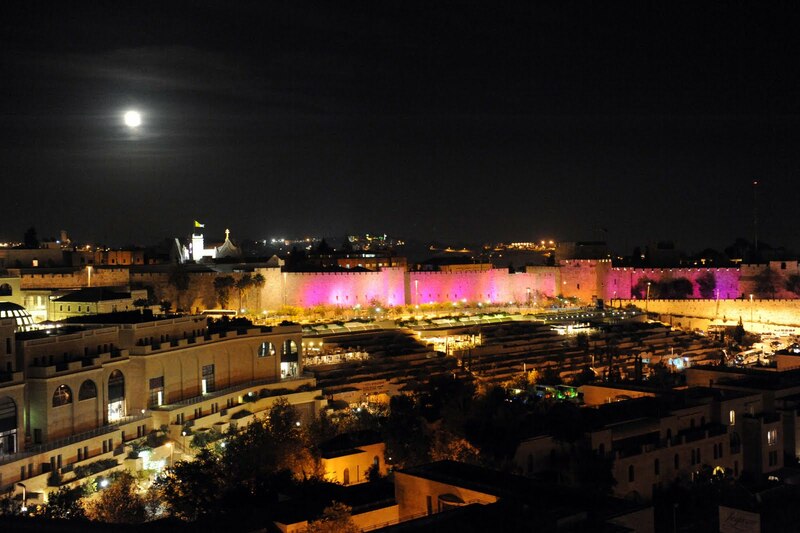 "Significant historic sites were lit in pink and hundreds will gather for the first Susan G. Komen Race for the Cure® in Israel, as delegates from global and Israeli organizations gather to advance the breast cancer movement in a mission trip to Israel Oct. 25-28. Susan G. Komen for the Cure®, the world’s largest breast cancer organization, is partnering with the City of Jerusalem, Hadassah®, the Women’s Zionist Organization of America, and health, science and advocacy organizations for the historic week that will also launch the Israel Breast Cancer Collaborative. Today was a difficult day for RivkA. RivkA was in a lot of pain for most of the day. Throughout the day she was being tended to by her family and hospital staff to try and keep her as comfortable as possible in her weakened condition. This evening, RivkA's husband Moshe asked her if she wanted to see any of the guests who had patiently waited (and stayed) for a chance to see her, and she answered, "yes." Her friends were able to briefly see her, and that made RivkA happy. The majority of people didn't get to see her today, but RivkA's family is encouraging people to come, on the chance RikvA might be able to see them at some point. Hoping for an easier day tomorrow. "I feel like I’m in a different state…" – these were the words RivkA repeated to us a few times, as she tried to put her thoughts in order for a blog post. When I visited RivkA on Sunday evening, she was already very tired. After some very difficult days during which she barely managed to communicate, Sunday was not just a “good day,” but an “excellent and amazing day,” as she spent quality time – quality communicative time, with her children, husband, parents and siblings. By the evening when we visited, Rivka was exhausted. But she smiled at our jokes, laughed a bit, gave us a “thumbs up” for something she agreed with, and even laughed at a computer joke. On Monday morning, RivkA’s brother sent me an audio note, where I heard RivkA request that friends come to visit her…and she was blessed with many friends who came to entertain her. She happily sang along as a friend played their guitar, and acknowledged the presence of the so many people who came to visit her. On Tuesday, RivkA slept most of the day. When she was awake she was still rather drowsy. The vast majority of the many people who came to visit her weren’t able to talk to her, and instead spent time talking to RivkA’s family. People are still welcome to come and visit, even though RivkA may be sleeping. On behalf of RivkA and her family, please continue to visit, pray and send positive thoughts for RivkA bat Teirtzel. PS: I'm sorry that there hasn't been more updates on the blog. Having discussed the issue with RivkA's husband, I will now be posting more regular updates. Update: If you come for a visit, please plan on keeping actual visit time with RivkA, short. All the food that's been brought to the hospital is greatly appreciated, yet please refrain from bringing BAKED GOODS. A post should be up here later today, as dictated by RivkA. Important: As opposed to yesterday (Sunday) -- today friends are welcome to visit RivkA, for short visits. Also, please be understanding that you may have to wait a bit to see her (depending on the number of people in her room). Please understand that family conversations with RivkA will take priority over visitors. RivkA’s looking forward to seeing you! And she specifically told me last night, "tell people to check the blog for updates." As her family, we know just how special RivkA is. It's no secret that she has friends from all over and from all walks of life. We are very touched by all you who have called to offer support and with offers to help. It reminds us that she is not just special to us, but to so many others. Jackie, a friend and neighbor of RivkA's, has generously taken it upon herself to organize help for the family when needed. I am moved by the many offers of help that I am receiving, but I am also finding myself overwhelmed by them. In addition to the time that I am spending with Rivka and tending to her needs, I am also trying to devote the time, care, and attention to our children that they need from me at this very difficult time. I very much appreciate the constant phone calls that I'm receiving from so many people, and the outpouring of love, concern, and offers off assistance. But at the same time, I am simply innundated by them, in a manner that is difficult for me to process and that affects my availability to the children. We do indeed need assistance, but it needs to be channelled in a way that allows me to spend the time together with my family that we need right now to support one another. Your expressions of support and love mean a great deal to me. Please, do not stop sending them -- but if at all possible, post them here, where I can sit and read them properly at at a time during the day when my time and attention is not needed elsewhere. If you would rather send me a personal note, please send it to thematityas@gmail.com. And please forgive me if I am unable to respond to them at this time. For all those who are offering assistance, please contact Jackie through the contact information above. And thank you so very much, from me and from the kids. A week passed with no posts and lots of other computer problems and I knew you would all start to worry...during that week. I started to have some “real” problems –with my vision and speech starting to blur. As time passed the problems really became serious – the pain increased severely and my liver began to fail. I have spent the last half of this “silent” period in the hospital. I wish I could end this post by reassuring you that all will be well. I cannot...but there is room for hope. The situation with my liver can change; we can find a balance of pain management that doesn't make me woozy and we can pray. At the end of the day, it is God's challenges. God is our ultimate caretaker and we will be taken care of. Update; In the spirit of this blog being RivkA's thoughts, the information about the tehillim request is being moved to the comments section. My recent disappearance had nothing to do with my cancer. We simply did not have access to the internet for a week or so. Finally, we took advantage of someone who offered to help us and put him in charge of getting us back on line. That said, my "situation" is not that great. We still have hope, but things are not that great. So we appreciate any extra davening and any extra mitzvot performed for our merit. As I know more, I will keep you posted. For now, we know that my liver is not functioning well, I finished this round of Whole Brain Radiation (today I had my last WBR treatment), and we are waiting for more blood tests (this Wednesday) before making any decisions. In short, cancer did not cause the delay in communication, but the technical problems that we have been experiencing certainly include cancer complication. Doxil got canceled because it does bad things when combined with radiation. Denosunab (bone drug) got canceled because my Calcium was too low. My platelets, hemoglobin, and various other things were also too low, so I needed two units of blood, BUT but it was too late and I would have to return tomorrow. Home: Canceled swimming lessons for the next day & Went to Sleep. Home: My left foot ballooned up to 2-3 x the regular size; I could barely walk. My GP, concerned that thrombosis caused the swelling, sent me to the ER. Sha'are Zedek: Ultrasound ruled out thrombosis. Option: Spend night at hospital and receive two units of blood while sleeping (or go home and receive blood in the morning). Tired of running to and from the hospitals, the idea of killing two birds with one stone (i.e. getting the blood while I slept) appealed to me. However, I would only stay if Moshe agreed to go home, to be with the kids in the morning and reassure them that everything was okay. After a bit of persuasion, Moshe agreed. I was so tired, I slept quite soundly, despite all the beeping and buzzing. Woke up to discover I only received one unit of blood during the night. Received the second unit of blood. Ate three bowls of farina (solet, milk and sugar) -- I was hungry! A friend (SS) came to keep me company and, when I finished, to take me to radiation. Met with Oncologist, to discuss my liver. Still bruise fast and heal slowly. Still have severe back pain. Still have hip pain and muscular pain. Still feel tired and weak. We did a CT of my liver . We did an MRI of my liver. We did a PET CT of my liver. We did a liver scan of my liver. We do not yet know the results. Some of the blood work regarding liver functionins is also a bit suspicious. Still, nothing is conclusive yet. Remember, a year and a half ago, when I discovered tumors on my brain and I freaked out about brain mets? One of the things my oncologist emphasized was that tumors on my liver would be far more scary. Not to worry, I am still not freaking out. Another thing my oncologist emphasizes is that we do not deal with "what ifs." We will not decide how to handle my current medical situation, until we know what it is. So, until we know the facts, we wait. Meanwhile, we have had a few harrowing days. A few weeks ago, I noticed an unusual numbness in my lower lip, as if I had received novacain at the dentist, but it did not wear off. The 2 1/2 cm (approx.1") wide affected area included my lower lip, my gums, my inner mouth, my tongue, my upper lip, and even my cheek. At times, I barely noticed the discomfort. During the last few days, however, there have been moments when my speach was impared and moments when I felt severe discomfort, even pain. I thought this might pass, but it seems to be increasing in severity. I am trying not to panic, but I do not want the situation to remain as is.